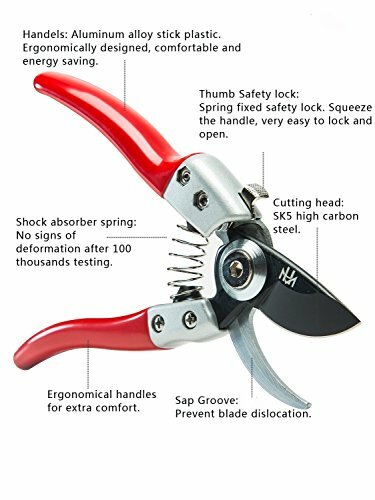 This reliable pruning shears is ideal for all varieties of general pruning tasks. Its cutting ability is stronger than ordinary pruning shears. A fully hardened, precision-ground steel blade stays sharp longer, and a rust-resistant, PTFE coating with oil makes cutting easier. 1. Please open the safety lock. Squeeze the handle, the lock will automatically open. 2. The blade is perpendicular to cut plant, which is conducive to the pruning, and the pruning is more energy saving. 3. Please turn off the safety lock to ensure the safety when not in use. Lock step: Hold the handle, and push the locking slide up. 1. Store in a dry place. Regular maintenance of the blade and wipe rust oil will increase the pruning shears's life. 2. We offer the lifetime warranty, if there are any quality problem, please contact us, send your order number and take some photos of the product to us, we will provide a replacement to you ASAP. Our Service - 100% NO RISK MONEY BACK GUARANTEE. ★QUALITY BLADE - Quality blade made of high carbon SK-5 steel with PTFE Coating. SK5 carbon steel blades HRC 57±1°, ultra strong, stays sharper than your ordinary blade and lasts even longer! Soft and hard branches can be easily cut.The curvature between the handle and the blade presents unique 45°which will not hurt the branches buds as you cut. ★SAFETY LOCK - Spring fixed safety lock, very easy to lock and open. Do not worry about a pruning shear lock that might become loose and flimsy during use or after locking. ★COMFORTABLE EXPERIENCE - The cushion and shock absorber soften the impact upon finishing cutting. Provide a comfortable experience. And your hand and wrist will be protected better. ★ERGONOMIC COMFORTABLE DESIGN - Ergonomically design non-slip handles are strong, comfortable and lightweight. ★EFFORTLESS CUTTING BY SPRING MECHANISM - Quality spring made of high-carbon steel that will not be deformed during use. As you squeeze the pruning shears, the spring will shrink, providing ever-increasing pressure, thus decrease the force you need to apply on the handle.Replaceable spring increases life. If you have any questions about this product by M&H garden, contact us by completing and submitting the form below. If you are looking for a specif part number, please include it with your message.